A few months ago the comex had 303 tonnes of total gold. Today the total inventory rests at 247.02 tonnes for a loss of 56 tonnes over that period. In silver, the open interest fell by 729 contracts despite yesterday’s rise in price of $0.17. The OI refuses to go down despite raids. Somebody has extremely strong hands and are very patient. The total silver OI still remains relatively high with today’s reading at 149,470 contracts. The big December silver OI contract fell by 79 contracts down to 101 contracts. In gold we had a slight rise in OI with the rise in price of gold yesterday to the tune of $0.90. The total comex gold OI rests tonight at 373,815 for a gain of 2072 contracts. The December gold OI rests tonight at 764 contracts losing 7 contracts. Again, for the umpteenth time, gold surpassed the $1200 mark only to be repelled back. Gold’s zenith was $1212.00 set at 5 am early this morning and its nadir at $1193.50 at 11 am (well after London’s second fix). I strongly believe that gold at 1200 is very toxic to our bankers with the huge number of derivatives and forwards placed by them. It is useless to analyze trading because the bankers are manipulating gold and silver 24/7 for the entire 5 days of the week. all rates moved closer to the negative. The One month GOFO rates moved into negativity with the other others moving closer to backwardation. Now, all the months of GOFO rates( one, two,three six and 12 month GOFO moved towards to the negative, with the one month, two month and 3 months already negative . On the 22nd of September the LBMA stated that they will not publish GOFO rates. However today we still received today’s GOFO rates. These rates are still fully manipulated. London good delivery bars are still quite scarce. The total gold comex open interest rose today by 2072 contracts from 371,743 all the way up to 373,815 with gold slightly up by $0.90 yesterday (at the comex close). We are now into the big December contract month where the number of OI standing for the gold metal registers 764 contracts for a loss of 7 contracts. We had 7 delivery notices served yesterday so we neither gained nor lost any contracts standing for the December contract month. The non active January contract month rose by 20 contracts up to 473. The next big delivery month is February and here the OI fell to 225,547 contracts for a loss of 945 contracts. The estimated volume today was poor at 88,467. The confirmed volume yesterday was very good at 181,283 although they had help from our high frequency traders. The comex now has no credibility and many investors have vanished from this crooked casino. Today we had 0 notices filed for nil oz . And now for the wild silver comex results. Silver OI fell slightly by 729 contracts from 150,199 down to 149,470 even though silver was up by $0.17 yesterday.We are again losing more short covering from our bankers. The big December active contract month saw it’s OI fall by 79 contracts down to 101 contracts. We had 72 notices served upon on yesterday. Thus we lost 7 contracts or an additional 35,000 oz will not stand. The estimated volume today was awful at 20,894. The confirmed volume yesterday was huge at 51,041. We had 0 notices filed for nil oz today. It now seems that most of the volume at the comex is done off hours. Withdrawals from Customer Inventory in oz 1,478.99 oz (Brinks). To calculate the total number of gold ounces standing for the December contract month, we take the total number of notices filed for the month (2648) x 100 oz to which we add the difference between the OI for the front month of December (764) minus the # gold notices filed today (0) x 100 oz = 341,200 the amount of gold oz standing for the December contract month. we neither gained nor lost any gold contracts standing today. Total of all silver inventory (dealer and customer) 175.433 million oz. The total number of notices filed today is represented by 0 contracts for nil oz. To calculate the number of silver ounces that will stand for delivery in December, we take the total number of notices filed for the month (2933) x 5,000 oz to which we add the difference between the total OI for the front month of December (101) minus (the number of notices filed today (0) x 5,000 oz = the total number of silver oz standing so far in November. Thus: 2933 contracts x 5000 oz + (101) OI for the November contract month – 0 (the number of notices filed today) =15,170,000 oz of silver that will stand for delivery in December. 1. Central Fund of Canada: traded at Negative 9.7% percent to NAV in usa funds and Negative 9.6 % to NAV for Cdn funds!!!!!!! Note: Sprott silver trust back into positive territory at 0.03%. 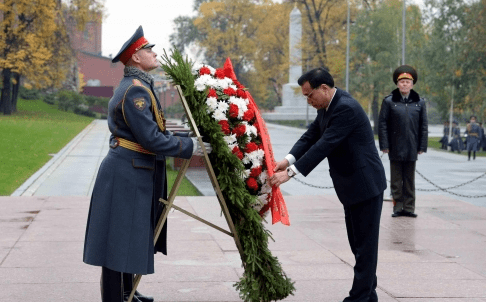 Is Russia Being Driven Into the Arms of China? The “isolation of Russia” idea is one which has been receiving a lot of traction of late. Russia’s recent economic woes have sometimes been covered with barely contained glee despite the hardships that average Russians may have to endure if the rouble continues to collapse … not to mention the inevitable geo-political backlash. Russia has become isolated from its western neighbours on account of the putsch in Ukraine which led to the predominantly ethnically Russian Crimea seceding from Kiev through a democratic process. European governments slavishly adhere to U.S. imposed sanctions. So from a western elite point of view, Russia is indeed isolated. Whether antagonising Russia is damaging to Russia is a moot point. Certainly in Russia’s current straits the bankrupt west is in no position to help. European farmers are suffering from loss of export markets while Europe is still dependent on Russian natural gas. So how “isolated” is Russia in reality? Firstly, it is worth pointing out the obvious fact that countries do not have “friends”, just “interests”. Representatives of countries may have good relationships but these are built on expediency – not friendship. So while there may be a great deal of distrust between the major powers of Asia these issues are being overlooked for now because it is expedient. Standards of living across the board have been rising in Asia for twenty years. It is in no countries interest to enter into conflict. By contrast, the west – led by the U.S. – has seen a remarkable fall in living standards over the same period. The bubble, prior to the 2008 crash, was not a golden-age for families as increasingly both parents were forced to work to just afford a roof over their heads. The relationship between Russia and China has morphed with these changes. Russia supplies China with hi-tech military hardware. Russia has negotiated two major natural gas deals with China in the last year. China expects to double it’s gas usage by 2030. So from a Chinese point of view it is certainly expedient to keep Russia on side. “Russia could fall back on its 150 billion yuan (HK$189.8 billion) currency swap agreement with China if the rouble continues to plunge”. If the swap deal is activated for this purpose, it would mark the first time China is called upon to use its currency to bail out another currency in crisis. The deal was signed by the two central banks in October, when Premier Li Keqiang visited Russia. “Russia badly needs liquidity support and the swap line could be an ideal tool,” said Bank of Communications chief economist, Lian Ping. The swap allows the central banks to directly buy yuan and rouble in the two currencies, rather than via the U.S .dollar. This highlights the long-term error of the west – pushing Russia into China’s sphere of influence. For the first time in fifty years a country may be bailed out using a currency other than the dollar. This, possibly, paves the way for the Chinese Yuan to assume the role of a global reserve currency. Also, it is worth noting that a weak Russia is not in China’s military interest at this time of simmering geopolitical tensions. In the event of problems in the international monetary system – sellers of tangible wealth will want payment in a currency with some intrinsic value. Today’s AM fix was USD 1,210.75, EUR 982.03 and GBP 773.64 per ounce. Yesterday’s AM fix was USD 1,199.00, EUR 962.36 and GBP 763.16 per ounce. Spot gold in London rose over 2% after the Federal Reserve stated yesterday that it would take a patient approach towards increasing interest rates. This led to rising stock and commodities markets and hurt the U.S. dollar. Gold in Singapore rose nearly 1% to $1,202.08 an ounce, and traded at $1,201.11 at 2:49 p.m. in Singapore, noted Bloomberg. U.S. Fed chief, Janet Yellen, said the Fed was not likely to raise rates for “at least a couple of meetings”, this has market participants focused on April 2015. In London, spot gold climbed 1.8% to $1,209.46 an ounce after 1040 GMT. Comex U.S. February gold was up 1.3% at $1,209.90 an ounce. Spot silver gained 3.2% to $16.19 an ounce. Spot platinum was up 2.2% at $1,212.60 an ounce, while spot palladium rose 1.8% to $789.63 an ounce. LONDON — The Swiss franc hit a 28-month trough against the dollar and fell against the euro on Thursday after the Swiss National Bank said it would introduce negative interest rates to stop further currency appreciation. In a surprise statement, the SNB said it would impose an interest rate of -0.25 percent on some large deposits held by investors in Swiss francs, as it seeks to discourage buying of the currency as a safe haven. Koos Jansen delves into the decision by Australia to audit the gold at the Bank of England. How on earth could there be something wrong with England’s figure of 80 tonnes for Australia?. Decisions like this don’t happen in a black hole. Something changed the RBA’s mind, between August 2012 and December 2012, on making the location of Australia’s Gold reserves public. From my observation, the RBA tends to follow the lead of other Central Banks, so the decision to release information on the location of Australia’s Gold may have been a result of Germany’s Central Bank (Deutsche Bundesbank) deciding to do so in October 2012 (interview containing the information originally released is no longer published on the site, butavailable via Web Archive). Only a month later, in November 2012, the Austrian Central Bank released the location of their Gold reserves, revealing that 80% resided in the UK, 3% in Switzerland and 17% in Austria. Cue the RBA feeling comfortable to release the location details of Australia’s Gold around 1 month later. A recent experience of mine with the RBA further highlighted their desire to follow in the footsteps of other Central Banks rather than to think for themselves. A Freedom Of Information (FOI) request I made for the Gold bar list was initially rejected, but after lodging an appeal with the Office of the Australian Information Commissioner (OIAC), highlighting that the United States published a list of their Gold bars details (sans the serial number), the RBA decided to follow suit (RBA Gold Bar Details). Gold holdings at the end of June 2014 were around 80 tonnes, unchanged from the previous year. Gold prices rose by 9 per cent in Australian dollar terms in 2013/14, increasing the value of the Reserve Bank’s holdings of gold by around $0.3 billion to $3.6 billion. Activity in the gold lending market remained subdued, with the Bank having only 1 tonne of gold on loan during the year. Income earned on that loan amounted to $0.2 million. During the year in review, the Bank audited its gold holdings, including that portion held in safe custody at the Bank of England. A question posed by email to the RBA earlier in the year suggested that RBA officials had performed the audit themselves. I decided to lodge another FOI request. In February 2013, the Assistant Governor (Financial Markets) requested the Audit Department to include in its audit program a review of the Bank’s gold holdings at the Bank of England (BoE). The Chief Representative in EU approached the BoE to facilitate this review and in late May 2013 initial planning discussions were held with BoE staff with tentative agreement that the review would take place in September 2013. An on-site physical verification on September 23, 2013, which will take 4-5 days to complete, assuming two RBA auditors are involved given the proposed scope. (b) inform debate on a matter of public importance; the Bank’s gold holdings, while important and of interest to some, are not a matter of public importance generating any level of debate. (c) promote effective oversight of public expenditure; release of the information would not do this. The released documents (mostly a chain of various emails) also suggested the RBA has been invited back for another review in 12 months. Given that the RBA has followed the lead of other countries to release reserve location details, perform audits and release (some) bar list details, it will be interesting to see whether they go further and follow the lead of the many countries now deciding to repatriate some or all of their Gold reserves…However discussions on the RBA audit were already well advanced at that time. I’m sharing links and opinions daily on Twitter (@BullionBaron). A terrific article penned by “It’s a Mystery” as the author delves into the Russian conflict. He states correctly that the huge plunge in the rouble is a western attack on Russia. The United States declared economic war on Russia. It is hard to pinpoint the why of the matter but in this author’s opinion it always comes back to US dollar dominance. Russia has made no secret of its disdain for the global pricing mechanism of oil. The chart below shows what matters in the pricing of oil and it has zero to do with shale miracles or over supply. It is the dollar and only the dollar that matters in the pricing of oil with an exception being an act of nature. Much like the gold market, supply and demand fundamentals are completely ignored as the pricing of gold revolves around the dollar. Countries such as Russia understand fully that this dynamic of dollar dominance leaves them very vulnerable to shocks. The same is true of all resource rich countries. While some of them see the US as an ally and go along with this, Saudi being the obvious one, the Russian’s have made it clear they want change. Make no mistake about it the Russian’s will get the change they desire. The chart below shows the dollar against the Ruble. That chart is an act of economic war as the West has attacked the currency of a sovereign nation for UNECONOMIC reasons. Let me explain the previous sentence. Russian debt to GDP is roughly 14%. Their debt to GDP is pristine. Japan’s is 227%, Greece 175%, Italy 132%, and the US 105%. Now can someone kindly explain why a currency would implode like the Ruble when their financial condition relative to the West and Japan looks like a Ferrari among a bunch of Ford Pintos? You could argue that they are highly dependent on oil. True, but so are other nations and are you certain oil will remain this low for an extended period? The next chart is the dollar against the Kuwati Dinar, a nation wholly dependent on hydrocarbons. Certainly the dollar has rallied against it but that chart is not even a faint resemblance to the Ruble. Now, how is the US able to pull this off without a hitch? Ladies and Gentlemen may I show you why the Saudis are NEVER spoken ill of in the US no matter what they do. The Saudi Riyal is PEGGED to the dollar at 3.75 to 1. This occurred in 1986. Why is this crucial? Simply compare the chart below to that of the Ruble and you have your answer. Isn’t it odd that you don’t hear anyone talking or writing about challenging this currency peg? We brought this article to your attention a few days ago. It is worth repeating.. Guest Post: Is Russia Selling Oil For Gold? This article was originally published at InvestCafe.ru in Russian. The translation in English was first published at Gold-Eagle.com. Moreover, in the third quarter the purchases by Russia of physical gold are at an all-time high, record levels. In the third quarter of this year, Russia had purchased an incredible amount of gold in the amount of 55 tons. It’s more than all the central banks of all countries of the world combined (according to official data)! There is another interesting element in Putin’s game. It’s Russian uranium. Every sixth light bulb in the USA depends on its supply, which Russia sells to the US too…for dollars. The idea of this economic golden trap for the West is probably not authored by Putin himself. Most likely it was the idea of Putin’s Advisor for Economic Affairs – Dr. Sergey Glazyev. Otherwise, why seemingly not involved in business bureaucrat Glazyev, along with many Russian businessmen, was personally included by Washington on the sanction list? The idea of an economist, Dr. Glazyev was brilliantly executed by Putin…but with full endorsement from his Chinese colleague – XI Jinping. China recently announced that it will cease to increase its gold and currency reserves denominated in US dollars.Considering the growing trade deficit between the US and China (the current difference is five times in favor of China), then this statement translated from the financial language reads: “China stops selling their goods for dollars”. The world’s media chose not to notice this grandest in the recent monetary historic event . The issue is not that China literally refuses to sell its goods for US dollars. China, of course, will continue to accept US dollars as an intermediate means of payment for its goods. But, having taken dollars, China will immediately get rid of them and replace with something else in the structure of its gold and currency reserves. Otherwise the statement made by the monetary authorities of China loses its meaning: “We are stopping the increase of our gold and currency reserves, denominated in US dollars.” That is,China will no longer buy United States Treasury bonds for dollars earned from trade with any countries, as they did this before. In this aspect, the solitaire of Russian-Chinese relations is extremely successful for Moscow and Beijing. Russia buys goods from China directly for gold at its current price. While China buys Russian energy resources for gold at its current price. At this Russian-Chinese festival of life there is a place for everything: Chinese goods, Russian energy resources, and gold – as a means of mutual payment. Only the US dollar has no place at this festival of life. And this is not surprising. Because the US dollar is not a Chinese product, nor a Russian energy resource. It is only an intermediate financial instrument of settlement – and an unnecessary intermediary. And it is customary to exclude unnecessary intermediaries from the interaction of two independent business partners. Emphasis on the phrase “physical gold” is made because in exchange for its physical, not ‘paper’ energy resources, Russia is now withdrawing gold from the West, but only in its physical, not paper form. China accomplishes this by acquiring from the West the artificially devalued physical gold as a payment for physical delivery of real products to the West. The West hopes that Russia and China will accept as payment for their energy resources and goods…the “shitcoin” or so-called “paper gold” of various kinds also did not materialize. Russia and China are only interested in real gold and only the physical metal as a final means of payment. In this brilliantly played by Putin economic combination, physical gold from the reserves of the West is rapidly flowing to Russia, China, Brazil, Kazakhstan and India (i.e. the BRICS countries). At the current rate of reduction of reserves of physical gold, the West simply does not have the time to do anything against Putin’s Russia until the collapse of the entire Western petrodollar world. In chess the situation in which Putin has put the West, led by the US, is called “time trouble”. Led by Russia and China, what the BRICS are doing now is actually changing the role and status of the US dollar in the global monetary system. From the ultimate means of payment and asset accumulation, the national currency of the USA, by the joint actions of Moscow and Beijing is turned into only an intermediate means of payment. Intended only to exchange this interim payment for another and the ultimate financial asset – gold. Thus, the US dollar actually loses its role as the ultimate means of payment and asset accumulation, yielding both of those roles to another recognized, denationalized and depoliticized monetary asset – GOLD! Because, firstly, the population of Russia, unlike people in many other countries, does not wish to exchange their freedom and the future of their children for Western kielbasa (meat sausage). This is evident from the record ratings of Putin, regularly published by the leading Western rating agencies. Personal friendship of Washington protégé Navalny with Senator McCain played for him and Washington a very negative role. Having learned this fact from the media, 98% of the Russian population now perceive Navalny only as a vassal of Washington and a traitor to Russia’s national interests. Therefore Western professionals, who have not yet lost their mind, cannot dream about any color revolution in Russia. As for the second traditional Western way of direct military aggression, Russia is certainly not Yugoslavia, not Iraq nor Libya. In any non-nuclear military operation against Russia, in the territory of Russia, the West led by the US is doomed to defeat. And the generals in the Pentagon exercising real leadership of NATO forces are aware of this. Similarly hopeless is a nuclear war against Russia, including the concept of so-called “preventive disarming nuclear strike”. NATO is simply not technically able to strike a blow that would completely disarm the nuclear potential of Russia in all its many manifestations. A massive nuclear retaliatory strike on the enemy or a pool of enemies would be inevitable. And its total capacity will be enough for survivors to envy the dead. That is, an exchange of nuclear strikes with a country like Russia is not a solution to the looming problem of the collapse of a petrodollar world. It is in the best case, a final chord and the last point in the history of its existence. In the worst case – a nuclear winter and the demise of all life on the planet, except for the bacteria mutated from radiation. The Western economic establishment can see and understand the essence of the situation. Leading Western economists are certainly aware of the severity of the predicament and hopelessness of the situation the Western world finds itself in, in Putin’s economic gold trap. After all, since the Bretton Woods agreements, we all know the Golden rule:“Who has more gold sets the rules.” But everyone in the West is silent about it. Silent because no one knows now how to get out of this situation. – How long will the West be able to buy oil and gas from Russia in exchange for physical gold? – And what will happen to the US petrodollar after the West runs out of physical gold to pay for Russian oil, gas and uranium, as well as to pay for Chinese goods? “Russia is at a critical juncture and given the sanctions placed upon them and the rapid decline in oil prices, they may be forced to dip into their gold reserves, if it happens it will push gold lower.” That is what, according to some people Bloomberg has quoted, is in the cards. So given the efforts to build this gold-backing for their nation’s currency, do we really expect Putin to now dump his physical: or perhaps more strategically suggest a true gold-backed currency and jawbone the currency that way? Looking at the correlation between gold and oil prices, the chart above illustrates that both commodities were moving closely in tandem over the July to September period. However, this link was broken in early October when gold embarked upon the new rally on weaker US dollar and some physical support, while oil prices continued to slide. The rally, nonetheless, proved to be short lived, as gold returned to its downtrend after hitting the $1,250 level on 21 October, and continued to move down, along with oil, for the remainder of the month. Starting from November we have seen gold and oil prices moving in opposite directions again. As we mentioned earlier, oil prices came under significant pressure on concerns about a growing global oil supply glut. On the contrary, gold recovered some of its earlier losses, supported by fresh buying interest in India on the news that the Reserve Bank of India (RBI) was reviewing gold import restrictions that were introduced last year. Towards the end of November, the RBI surprised the markets by announcing the withdrawal of the 80:20 rule, which saw gold imports surging to 150 tonnes that month, according to the latest statistics from the Indian Ministry of Commerce and Industry. In addition, worries over the potential impact of stronger US dollar on the global economy spurred some safe-haven buying. It is not surprising that Russia has been tackling its financial problems by selling the gold they have been accumulating. According to the IMF data this year, one of the world’s largest oil exporters acquired 115 tonnes in the January to September period, and added another 18.9 tonnes to their reserves in October. Russia has been purchasing the yellow metal at a faster pace this year, taking advantage of lower gold prices and, perhaps, preparing for the possibility of a long-lasting restrained relationship with the West and economic downturn. It appears possible that the Central Bank of Russia has started to sell off some of its gold reserves in December, with some sources reporting that official gold reserves dropped by $4.3 billion in the first week of the month. Of course, it should be noted that SocGen and its “sources” have a conflict: in an indirect way, none other than SocGen is suddenly very interested in Russia stabilizing its economy because as we wrote before, “Russia Contagion Spreads To European Banks : French SocGen, Austrian Raiffeisen Plummet” which also sent SocGen’s default risk higher in recent days. So if all it will take to stabilize the RUB sell off, reduce fears of Russian contagion, and halt the selloff of SocGen stocks is a “source” reporting what may or may not be the case, so be it. In any event, keep a close eye on the next update of Russian official gold holdings: it may well be the next big story of where gold is headed and, if true, an even more important question will be who is Russia selling its gold to. An extremely important commentary from Bill Holter. Please read carefully as this is what is going to happen!! Out of ammo, velocity and confidence are inverse. It is being said today’s FOMC announcement is “the most important of Yellen’s tenure”, I could not disagree more. In the past I have written pieces regarding the potential announcements by the FOMC and come to the conclusion “what can they possibly say?”. This is more true now, Janet Yellen et al cannot “say” anything of substance because they cannot “do” anything of substance. The Fed backed themselves into a corner of their own making several years ago, I believe it is only a matter of time before the markets “test” them. What options does the Fed have? Can they raise interest rates at all? Can they tighten credit at all? Can they really go the other way and institute truly negative interest rates? The answers are all NO, they are “frozen” of their own making and have only one option (really two in tandem). The Fed can only remain in place with interest rates nonexistent and must continually create (fund) debt and grow money supply while a Treasury arm, the PPT must guide, massage and dampen volatility of markets …ALL markets. The only thing currently being discussed is “when” will the Fed tighten? I would ask, when will QE 4 be instituted? The answer of course is when the markets seriously begin to implode again which may not even be more than a calendar month or two away. I am sure a part of their statement will include oil and energy prices. This is a market they cannot heal with monetary policy. The volatility has already occurred and the dead bodies already exist though we don’t yet know who they are. The dilemma the Fed has is they have no tools left other than outright support once markets begin to collapse. Their QE policies have already been seen as ineffective at supporting the real economy other than stabilizing decline. My question is this, when QE 4 becomes a necessity, will the markets “buy it” or will the phrase “three strikes and your out” come into play? What once worked to turn the real economy from contraction to recovery to an actual growth phase now has no power. The Fed only has an accelerator so to speak, the brake pedal is off limits. I have written many times on “velocity” and why it continues to decline. This is the sticking point, the money they create is being hoarded by the banks and not reaching Main St..
With regards to velocity, it is worth pointing out what is happening in Russia to illustrate a fallacy of main stream thought. As Jim Sinclair has tried to explain to anyone willing to listen, what comes our way in “dollar land” is a hyperinflation as a result of confidence breaking … a monetary event so to speak but one which results from human emotion. Western economists have incorrectly brainwashed the public into believing a hyperinflation can only be caused by “over printing”. This is ONLY one way, another way is when the currency itself loses confidence or credibility. Or, in the case of the ruble, loses its perceived “funding” (via energy revenues). 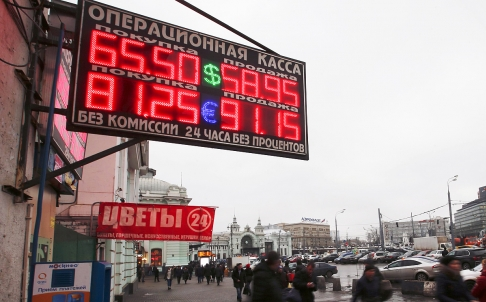 Russia is in the midst of an early hyperinflation if the ruble continues to decline. Watch as their economy “takes off” …briefly. The Russian people see what is happening and are now in a rush to “exchange” (spend) their devaluing currency for “stuff”. http://www.dailymail.co.uk/wires/ap/article-2877124/Russian-ruble-way-down.html THIS is another cause of hyperinflation, a currency going up in flames because of panicky velocity. Tying this back to the U.S. and the Fed’s “FRN’s”, velocity is now at record lows …as are interest rates. Neither can turn higher or the game is over. We live in the most leveraged financial and fiscal system in all of history. Interest rates cannot go up as they have in Russia. Velocity on the other hand MUST turn higher but CANNOT, let me explain. For any hope of the real economy moving higher, velocity must bottom and turn higher. The problem is, once velocity turns higher, it cannot (I should say “won’t”) stop because this will mean the mindset or thought process has changed. Look at it this way, the U.S. (the West) is facing the greatest potential margin call of all time. The entire system is a margin call waiting to happen. Less than 50% of the population supports a majority of the population. Some un Godly number of people in the U.S. live paycheck to paycheck and have no savings whatsoever. Real estate is completely levered, banks and brokers levered with all sorts of derivatives. State and local government finances are in disarray while the federal government is in debt beyond 100% of GDP …with admitted debt, 10 times over with future obligations. The Fed, for their part has become the biggest hedge fund in the world and have quintupled their balance sheet over 5 years …like I said, we await the biggest margin call of all time. Never forget this, the dollar has value ONLY because the debt underlying has “value”, a margin call will erase this in a panicked heartbeat! When this margin call does come (and it may already be happening as judged by the oil market), “velocity” will turn violently and overnight. The turn in velocity will be a symptom/cause of our currency devaluing. The rush out of dollars and into “stuff” as the Russians are now experiencing will in my opinion be far greater and much more rapid. “Confidence” and “velocity” are inverse of each other. We are currently at the height of confidence and the depths of velocity. Confidence is truly the only piece of chewing gum holding the game together. In the case of Russia, they have big brother China to stand by their side. China has set up currency hubs all over the world, we will soon see why. They also signed two major trade deals with Russia, the capital from these deals can and will be used to steady Russia. Who will steady the U.S.? Our markets have turned schizophrenic, up and down huge amounts on a daily basis. Who will step up to support the U.S.? In fact, if you look at the “direction” of the rest of the world, they seem to be trying to distance themselves from us. By the time this is over, the world will be operating under a New World Order, just not the one American elites have envisioned. In fact, I can see a world where power has shifted along with trading partners and alliances with the U.S. sitting in a self inflicted and isolated corner with a tin cup in hand …and a dunce cap on top! I plan to write just two more pieces for the year. One next week and one the week of New Year’s. Both ends of my mental candle are getting very close together, I need a little down time. Because so many have requested what I think it will look like “the day after”, I plan to write a missive from a hypothetical (but probably not so “fictional”) basis. 1. Stocks up on major Asian bourses as the yen continues to rise to 118.70, a rise of 4 basis points. 3fOil: WTI 57.71 Brent: 62.72 /all eyes are focusing on oil prices. This should cause major defaults. 3l Obama passes lethal aid bill to provide direct aid to the Ukrainians/also passes more sanctions against Putin. 3o First round of Greek Presidential elections/needs 180 votes but only 160 votes garnered for the candidate Dimas . After drifting unchanged for much of the overnight session, US futures exploded higher shortly after thepreviously noted SNB’s NIRP announcement, which took place at 2 am eastern, which made it explicit that yet another banks will herd the bouncing dead cats right into new all time stock market highs, and following the European open, were carried even higher as the global “risk-on” momentum ignition algos woke up, spiking all recently depressed assets higher, including energy as Brent rose almost 3% despite Saudi Arabia’s oil minister Ali al-Naimi once again saying “it is difficult if not impossible” for OPEC and his kingdom to reduce output. Paradoxically, the Saudi also agreed with Janet Yellen in stating that the oil price drop was “temporary” suggesting that the oil price shock is not supply-driven, but is merely a function of the financialization of oil as collateral and an asset. And now that the SNB has made it clear that it too will urge depositors to put their money into risk assets, preferably stocks but crude also works, crude is once again becoming disconnected from recent supply (and demand) concerns and rising higher, in the process taking energy equities (and junk bonds) higher with it. Elsewhere overnight, Chinese stocks took a breather last night (the SHCOMP was basically unchanged) from the breakneck surge in recent weeks that has seen the Shanghai Composite rise from under 2500 to over 3000 in one month on hopes of even more imminent central bank intervention. Ironically this happened even as the central bank offered short-term loans to commercial lenders as the benchmark money-market rate jumped the most in 11 months (yes, another central bank intervention). European equities followed suit from their US counterparts and trade firmly in the green in the aftermath of yesterday’s FOMC release, whereby the Fed decided not to fully remove the ‘considerable time pledge’. Despite some hawkish undertones that left the door open to a potential rate hike as early as 2015, equity markets trade in positive territory in a pullback of this week’s heavy losses, with Fed rate lift-off still not immediately on the cards. The strength in equities saw flows out of USTs late in the US session yesterday, although have since pulled off their worst levels while Bunds ebbed lower after the German IFO report. Albeit in-line with analyst exp. release, it failed to deliver the dreary outlook that perhaps the market was positioned for. Further upside for European equities has stemmed from the surprise decision by the SNB to cut their key interest rate, with the SNB head Jordan attributing the move to act as a deterrent to CHF inflows. Additionally, positive sentiment from a stock perspective has also been enhanced by a seemingly stabilization of Russian asset classes and a bounce in oil prices. Whatever the reason behind the latest epic, V-shaped move in stocks, US equity futures are now some 70 points higher from where they were just 48 hours ago, having recouped a week’s worth of losses in 2 days, and are on route to recovering virtually all losses incurred since the first week of December. And while one can debate if the energy tumble is supply or demand driven, one thing is certain: markets are about to do what they do best – completely ignore yet another warning signal that not all is well. And why not: after all central banks will always be there to nudge and bail anyone out. European equities follow suit from the US and enter the North American open in the green. SNB surprises markets by introducing negative rates in an unscheduled release. Treasuries decline amid global surge in stocks and other risk assets after Fed yesterday pledged patience on raising rates; volumes may decline as Christmas holiday approaches. China new-home prices fell y/y by the most in 2014 last month in Beijing, Shanghai, Guangzhou and Shenzhen, according to govt data released today. In FX markets, USD strength has dictated the state of play in the wake of the FOMC decision, with the USD-index pulling away from its recent lows and now remains in favour heading into the year-end. This initially saw USD out-muscle its major counterparts, although has since comes off its best levels. CHF has since pared some off its post-SNB weakness, with participants booking profits on earlier gains in EUR/CHF, while GBP benefited in a fast-money move from a particularly strong UK retail sales report (ex-auto M/M 1.7% vs Exp. 0.3%). Elsewhere, NZD has also modestly recovered from overnight losses stemming from a largely mixed NZ GDP report. WTI and Brent crude futures initially opened lower in a continuation of yesterday’s losses, although have since spiked higher amid no fundamental news, although from a technical perspective WTI and Brent broke back above USD 57/bbl and USD 62/bbl respectively. In metals markets, spot gold and silver remain at their post FOMC levels, while Copper prices traded relatively flat overnight to hold on to yesterday’s gains following mixed signals from the region after the China Beige Book suggested mild improvement in sales, profit and unemployment for H2, while the latest China property price data showed China New Home Prices declined at a faster pace. Additionally, this helped steel rebar bounce of 2-week lows. A big part of our outlook is that central banks still hold all the power in financial markets as they have done for several years. It was the Fed’s turn last night to demonstrate this as the S&P 500 (+2.04%) had its biggest day of the year. Net-net they probably gave something for both the doves and the hawks and a lot now seems to depend on whether inflation stays low or gravitates back towards 2%. If it’s the former then rates are unlikely to rise in 2015 and if it’s the latter then the Fed will want to raise rates. Overall the statement and press conference reflected a Fed confident they can start normalising soon but as ever they make this data dependant. If you’d have told me yesterday morning that the S&P was going to have its best day of the year I would have thought the meeting would have been more dovish than it actually was though. Running through the statement itself, much of the focus was on the ‘considerable time’ language which, whilst not removed, was replaced with ‘patience’ in regards to timing of the first rate hike. The committee did however make an effort to note that they see this as consistent with the previous statement – perhaps as a way to try to minimize the market impact. Yellen followed this up in the Q&A shortly after by saying that ‘the timing of the initial rise in the fed funds target as well as the path for target thereafter are contingent on economic conditions’. More pressing was perhaps the news that ‘it is unlikely to begin the normalization process for at least the next couple meetings’ which in effect rules out the January-March period but potentially brings April into play should we see encouraging signs from macro data through early next year. Dot points for the Fed Funds rate were lowered. The Median forecast now sits at 1.125% for 2015 (down from 1.375%) rising to 2.5% in 2016, down from 2.875% in the previous forecast. On inflation the message was generally mixed and difficult to argue either way for the doves or the hawks. The statement acknowledged that inflation continued to run below the long-run objective but did make a point to highlight the impact of lower energy prices on the headline. It was noted that market-based measures of inflation have declined further but survey measures on long-term expectations have remained unchanged. Hawks will argue for Yellen’s comments in her press conference that declines in oil prices will only have a transitory impact on inflation and that the committee expects inflation to still move gradually back towards 2% by 2016. Doves on the other hand however will look at the downgraded forecasts to the core reading to 1.2%-1.3% this year (from 1.5-1.7%) and 1-1.6% in 2015 (from 1.6%-1.9%). There were some modestly more positive comments with regards to the economic picture. Specifically the statement mentioned that ‘economic activity is expanding at a moderate pace’ whilst also noting that the recent drop in oil prices is a net plus for the economy. GDP expectations have been kept relatively unchanged for 2015 and 2016 although the forecast for this year was narrowed to 2.3%-2.4% and revised up from the 2.0%-2.2% September projection. Labour market chatter was encouraging. The FOMC noted that labour market conditions had ‘improved further’ and that a range of indicators ‘suggests that underutilization of labour resources continues to diminish’. The unemployment rate forecast was notched modestly lower for 2015 to 5.2%-5.3% (from 5.4%-5.6%). Both Fisher and Plosser joined Kocherlakota as dissenters. Plosser stated that the statement should not focus on the importance of time with regards to rate guidance whilst Fisher noted that improvement to the US economy has been quicker than expected and ahead of committee expectations. Kocherlakota – the lone dissenter in the October statement – noted ongoing low inflation and falling expectations as creating downside risks to the credibility of the 2% target. It’s hard to say how much influence yesterday’s CPI print had on the statement. A decline in the headline to -0.3% mom (and below consensus of -0.1% mom) was largely as a result of a 3.8% drop in energy costs which lowered the annualized rate to +1.3% yoy from +1.7% yoy. The core reading on the other hand came in as expected at +0.1% mom. Energy prices are projected to fall further in December so downward surprises to the headline continue to be a risk. Coming back to markets, as mentioned the S&P 500 closed firmer although bounced around post FOMC statement and then again during Yellen’s Q&A. The latter helped the index rally +1.2% into the close. Oil markets closed stronger with both WTI (+0.97%) and Brent (+1.95) firming to $56.47/bbl and $61.18/bbl respectively. Both grades traded some 5% higher intraday post-FOMC only to then pare those gains into the close. The flash-rally was enough to support energy stocks however, with the sector finishing +4.22%. Credit markets also firmed. CDX IG closed 7bps tighter whilst US HY energy names rallied 35bps in cash spread terms – the first day since December 5th that they have closed firmer. Treasuries bounced around with the changes in sentiment. Benchmark 10y yields closed 7.7bps higher at 2.136%. The Dollar closed firmer, the DXY ending +1.14%. Before all this in Europe the Stoxx 600 firmed into the close to end +0.14% – driven by similar gains to energy names (+3.13%). 10y German yields closed relatively unchanged at 0.592% as the final CPI reading for the euro-area came in unchanged with the headline +0.3% yoy and the core at +0.7% yoy. Peripheral yields closed anywhere from 3-7bps tighter, supported by comments from the ECB’s Coeure who was quoted as saying that ‘there is a large consensus in the governing council to do more, and we are discussing now on what tools to use’. Just wrapping up the data yesterday, UK unemployment remained steady at 6.0% although the claimant count ticked down a notch to 2.7%. Much of yesterday’s focus however was on Greece and Russia. Starting on the former, the results of the presidential election went largely as expected with Dimas – nominated by PM Samaras– gaining 160 votes (which included 5 from independent deputies) and well short of the 200 needed in the first two rounds. The result comes at the lower end of our resident expert George Saravelos’s range and is therefore something of a disappointment. The result means attention shifts to the second round on the 23rd and then a likely third round on the 29th when the number of votes needed drops to 180. Interestingly Greek assets closed firmer. The ASE finished +3.33% and Greek yields rallied across the curve – the 10y in particular tightening 29.7bps to 8.765%. Moving to Russia, the volatile swings in the ruble continue after a +9.31% rally yesterday to close at 61.59 versus the Dollar – bouncing off Tuesday’s all time lows. The move came about following an announcement from the Bank of Russia that they intend to support the banking sector through liquidity injections and looser capital requirements. The Dollar RTS index closed +14.16% whilst 10y hard currency yields tightened 49bps to 7.104%. Bank stocks rose significantly – Sberbank (+28.85%) and VTB Group (10.65%) both rallying in London trading. The moves also come before the anticipated press conference for Putin today. Before we look at the day ahead, bourses in Asia are trading firmer as we got to print – following the lead from the strong US close. The Nikkei (+2.25%) and Hang Seng (+0.96%) are stronger, whilst Chinese equities have reversed earlier losses after reported new home prices dropped 3.7% yoy to mark the third straight decline with prices falling in 67 out of 70 cities. The CSI 300 and Shanghai composite are +0.69% and +0.67% respectively. Looking ahead to today we kick off this morning in Europe with the German IFO and quickly follow up with retail sales in the UK. Later today we will also get construction output for the Euro-area as well as Italian trade data. In the US this afternoon, we start with the claims print and then quickly follow this up with flash composite and services PMI readings. We round out the releases with the Philadelphia Fed business outlook print and conference board leading index. Now we have the 2nd financial unit to enter into the negative interest rates. That is you pay to put your money in the Swiss bank. This follows the ECB’s negative NIRP. The reason for the move stated was Russian billionaires parking their money in Switzerland. The SNB has now stated that they are not welcome!! The Swiss National Bank (SNB) is imposing an interest rate of –0.25% on sight deposit account balances at the SNB, with the aim of taking the three-month Libor into negative territory. It is thus expanding the target range for the three-month Libor to –0.75% to 0.25% and extending it to its usual width of 1 percentage point. Negative interest will be levied on balances exceeding a given exemption threshold. The SNB reaffirms its commitment to the minimum exchange rate of CHF 1.20 per euro, and will continue to enforce it with the utmost determination. It remains the key instrument to avoid an undesirable tightening of monetary conditions resulting from a Swiss franc appreciation. Over the past few days, a number of factors have prompted increased demand for safe investments. The introduction of negative interest rates makes it less attractive to hold Swiss franc investments, and thereby supports the minimum exchange rate. The SNB is prepared to purchase foreign currency in unlimited quantities and to take further measures, if required. The franc weakened after the announcement, trading at 1.2045 per euro at 11:08 a.m. in Zurich. Against the dollar it fell to 97.82 centimes. In any event, at least the Swiss were kind enough to give the Russians an advance notice that their cash is not welcome in the country. After all Russian billionaires could have been merely “Cyprused”, all over again. Bottom line: The Governing Board of the SNB surprisingly announced this morning that it will introduce a negative rate of -0.25% on sight deposit account balances at the SNB. The SNB’s target range for the three-month Libor was also widened from 0.0% – +0.25% to -0.75% – +0.25%. In our view, today’s rate decision simply underlines the determination of the SNB to enforce the minimum exchange rate target for the CHF against the Euro. 1. This morning, the SNB surprisingly announced that, on January 22, it will introduce a negative interest rate of -25bp on reserve holdings from banks at the SNB, above a threshold of 20 times the minimum reserve requirement. The SNB’s target range for the three-month Libor was also widened from 0.0% – +0.25% to -0.75% – +0.25%. Over the last couple of days, the CHF has traded very close to the 1.20 level on the back of rising market volatility. The subsequent demand for safe investments attracted large capital inflows into Switzerland, eventually prompting the SNB to react. 2. According to the SNB, the measure is aimed at making investments into CHF less attractive. Although it is only banks that will have to pay the negative deposit rate, banks will pass on, to some extent at least, the negative rates to customers. It is noteworthy in that respect that some German banks – in response to the ECB’s negative rates – have also started charging some clients negative deposit rates. 3. It remains to be seen how effective this measure will be and the SNB will continue to rely on FX interventions to defend the minimum exchange rate. But the measure in any case shows the determination of the SNB to maintain the lower bound for the CHF against the Euro. It looks like China is bailing out Russia but activating the swap lines authorized in October. This is why there is no need for Russia to sell her gold. Russia may send gold as collateral to China for its aid to Russia. Earlier this evening China’s State Administration of Foreign Exchange’s (SAFE) Wang Yungui noted “the impact of the Russian Ruble depreciation was unclear yet, and, as Bloomberg reported, “SAFE is closely watching Ruble’s depreciation and encouraging companies to hedge Ruble risks.” His comments also echoed the ongoing FX reform agenda aimed at increasing Yuan flexibility which The South China Morning Post then hinted in a story entitled “Russia may seek China help to deal with crisis,” which noted that Russia could fall back on its 150 billion yuan ($24 billion) currency swap agreement with China if the ruble continues to plunge, that was signed in October. Furthermore, two bankers close to the PBOC reportedly said the swap-line was meant to reduce the role of the US dollar if China and Russia need to help each other overcome a liquidity squeeze. Adding that China plans sweeping reforms to promote FX flexibility. Russia could fall back on its 150 billion yuan (HK$189.8 billion) currency swap agreement with China if the rouble continues to plunge. “Russia badly needs liquidity support and the swap line could be an ideal tool,” said Bank of Communications chief economist Lian Ping. The swap allows the central banks to directly buy yuan and rouble in the two currencies, rather than via the US dollar. Two bankers close to the People’s Bank of China said it was meant to reduce the role of the US dollar if China and Russia need to help each other overcome a liquidity squeeze. China has currency swap deals with more than 20 monetary authorities around the world. Swaps are generally used to settle trade. The rouble has lost more than 50 per cent against the US dollar this year, pushing Russia to the brink of a currency crisis, though measures announced by the central bank helped it recover some ground yesterday. …as if to assure all involved parties that there will be enough capital support on both sides, the PBOC released a surprising announcementthat the central banks of China and Russia signed a 3-year, 150 billion yuan bilateral local-currency swap deal today, according to a statement posted on PBOC website. Deal can be expanded if both parties agree, statement says. Deal aims to make bilateral trade and direct investment more convenient and promote economic development in 2 nations. To be sure, some such as Bloomberg, are skeptical that the unprecedented pivot by Russia toward China as it shuns the west, will merely harm the Kremlin. Others, however, wonder: who will be left standing: Europe, with its chronic deficit of energy and reliance on Russia; or Russia, a country overflowing with natural resources, whose economy is currently underoing a dramatic and painful shift, as it scrambles to dissolve all linkages to the Petrodollar and face the Gas-O-Yuan? Is ‘isolated’ Russia about to be bailed out by the world’s largest economy China? We are pleased to announce the signing of the Treaty for the establishment of the BRICS Contingent Reserve Arrangement (CRA) with an initial size of US$ 100 billion. This arrangement will have apositive precautionary effect, help countries forestall short-term liquidity pressures, promote further BRICS cooperation, strengthen the global financial safety net and complement existing international arrangements….The Agreement is a framework for the provision of liquidity through currency swaps in response to actual or potential short-term balance of payments pressures. 2. Obama stated that he will sign the sanctions bill against Russia by the end of the week. Because he knows full well that is not the important part.The “lethal-aid” aspect is a direct provocation to Russia.. and he knows exactly how Putin will respond. As we reported over the weekend, in the tumult surrounding Citigroup’s annexation of Congress with the passage of the theatrically dramatic $303 trillion derivative quid-pro-$1.1 trillion spending quo, what most missed is that Congress also unanimously passed the The Ukraine Freedom Support Act of 2014, which not only expands Russian sanctions (read the details here) but far more impotantly, provides “lethal assistance to Ukraine’s military.” And as we explained, passage of this law is just the pretext some Russian legislators needed to push for a full-blown, preemptive military incursion in east-Ukraine. And with that, US “lethal aid” will shortly begin arriving in Kiev, which in turn will be just the pretext needed by Sergey Lavrov and the Kremlin to escalate the recent events in Russia as a direct attack by the West, and to demand retaliation against a US president who “does not reason” as the Russian media will appeal to the population in an attempt to “rally round the flag“, and as a result Russian tanks may have no choice but to enter the separatist territories in East Ukraine. What the western, and certainly NATO, response at that point will be, is far beyond our meager prediction skills. Having started at noon Moscow time (4am Eastern), Putin’s annual Q&A run for a massive three and a half hours, during which the Russian leader took numerous questions from the public and as expected, reiterated the key “rally around the flag” talking points that have permeated Russian rhetoric over the past few weeks as the economic situation in Russia deteriorated. As Bloomberg notes, the conference was attended by hundreds of reporters and carried live on television around the world, the event took on heightened importance this year as the president sought to reassure a Russian public unnerved by the ruble’s plummet. As caught by the WSJ, when he was asked by a Russian television reporter about the sense that new divisions in Europe have emerged since the Ukraine crisis, Putin blamed the tensions on the West, saying “they didn’t stop building walls” after the end of the Cold War. He accused the West of building up the North Atlantic Treaty Organization toward Russia’s borders and expanding an antimissile systems. In tough language, Mr. Putin returned to an analogy he’d used earlier this fall, comparing Russia to a bear in the Siberian Taiga wilderness, saying it was naive to hope that the West would leave Russia alone. “They will always try to put it in chains and once they have it in chains, they will take out its teeth and claws, which in this case means our strategic nuclear deterrent,” he said. “Once they’ve got the Taiga, they won’t need the bear,” he said, accusing Western leaders of saying publicly that Russia should be deprived of its vast natural resources. Putin did reserve some blame for his Russian peers, criticizing the central bank for not responding faster and halting the Ruble collapse. He vowed to guide the country through the current situation in the same way he steered Russia through the 2008 financial crisis, and warned citizens to brace for a recession. Somewhat ironically, Putin said that Russia shouldn’t waste currency reserves protecting the ruble as the country prepares for a downturn brought on by the collapse of the oil price and sanctions over the Ukraine conflict, he said. So will the presser do anything to change the status quo? Hardly: Putin will continue to be viewed as a pariah by the west, certainly for as long as he continues to challenge the US state department-imposed regime in the Ukraine. Meanwhile in Russia Putin is still enjoying popular support because the simple equation is that for the vast majority the recent territorial expansion courtesy of the full Crimean annexation is seen as worth the hardship and the soaring prices. Which is why Putin again accused the U.S. and European Union of using the Ukraine conflict as way to contain Russia as they have done since the end of the Cold War through the expansion of NATO, comparing the current situation to a new division akin to the Berlin Wall. Finally, Putin said he’s firmly in control of the country and is not in any way worried about a coup from within his ranks. “People in their hearts and souls feel that we, and I in particular, are acting in the interests of the vast majority,” he said. Judging by his record high popularity numbers, the people appear to believe him. Another casualty of the shale collapse!! Following one after another major and shale company announcing plans to trim capex (even as they miraculously still get to keep their revenue and EPS projections intact, for now), the latest victory handed to Saudi Arabia on a silver platter comes courtesy of Comstock Resources (Total Debt/EBITDA 2.4x, EBITDA $421MM, CapEx $674MM) Comstock Resources said earlier today that in response to low oil prices, plans to suspend oil directed drilling activity in its Eagle Ford shale properties and in Tuscaloosa Marine shale. It was not immediately clear how many high-paying oilfield jobs would be promptly terminated as a result of this unambiguously good development. Comstock Resources, Inc. (“Comstock” or the “Company”) (NYSE:CRK) announced that it has budgeted $307 million in 2015 for its drilling and completion activities. In response to low oil prices, the Company plans to suspend its oil directed drilling activity in its Eagle Ford shale properties in South and East Texas and in the Tuscaloosa Marine shale in Mississippi. Comstock has released its rig in the Tuscaloosa Marine shale and will postpone its drilling activity there until oil prices improve. Comstock currently has four operated rigs drilling on its Eagle Ford shale properties. The Company will release two of these rigs in early 2015 and will move the other two rigs to North Louisiana to start up a drilling program on its Haynesville shale natural gas properties. Comstock believes that improved completion technology, including longer laterals, will provide strong returns on drilling projects at current natural gas prices. Comstock has budgeted to drill 19 (18.6 net) horizontal wells in 2015. The Company expects to spend $161 million for drilling 14 (14.0 net) Haynesville/Bossier shale natural gas wells and $34 million for drilling five (4.6 net) wells on its East Texas and South Texas Eagle Ford shale acreage. The 2015 budget includes $49 million for completion costs of 13 (11.9 net) Eagle Ford shale wells that were drilled in 2014 but will be completed in 2015 and $63 million on facilities, recompletions and for other capital projects. Comstock plans to refrac ten of its existing Haynesville shale producing wells as part of the 2015 program. Comstock estimates that the drilling program will generate Company-wide oil production of 3.5 to 3.9 million barrels in 2015 and natural gas production of 55 to 60 Bcf. After three years of natural gas production declines, 2015 will mark a turnaround for the Company’s natural gas production. The Company will continue to assess the oil and natural gas markets throughout 2015 and will adjust its drilling program to reflect the appropriate mix of oil and natural gas wells in order to maximize returns. This morning in Europe, the euro is well down , trading now well below the 1.24 level at 1.2309 as Europe reacts to deflation and announcements of massive stimulation and crumbling bourses. In Japan Abe went all in with Abenomics with another round of QE purchasing 80 trillion yen from 70 trillion on Oct 31 and Sunday night won his big election. And now he wishes to give gift cards to poor people in order to spend. The yen continues to trade in yoyo fashion. This morning it continues to exhibit extreme havoc to our yen carry traders as it settled up in Japan by 14 basis points and settling just above the 117 barrier to 117.19 yen to the dollar. This would certainly blow up our yen carry traders with this rapid ascent. The pound is down this morning as it now trades just above the 1.57 level at 1.5714. (very worried about the health of Barclays Bank and the FX/precious metals criminal investigation). The Canadian dollar is down today trading at 1.1641 to the dollar. Your closing Spanish 10 year government bond, Thursday ,down 3 in basis points in yield from Wednesday night. Spanish 10 year bond yield: 1.74% !!!!!! The euro fell badly again in value during the afternoon , and it was way down by closing time , finishing well below the 1.23 level to 1.2284. The yen hardly moved in the afternoon, and it was up by closing to the tune of 1 basis points and closing just above the 118 cross at 118.76. The British pound gained considerable ground during the afternoon session and it was up on the day closing at 1.5673. The Canadian dollar was well up in the afternoon and was up on the day at 1.1596 to the dollar. Your closing USA dollar index: 89.20 up 7 cents from Wednesday. your 10 year USA bond yield , up 7 in basis points on the day: 2.21%!!!! Just 1 word… “Patient” and this idiotic market soars 700 Dow points! (and S&P 90 Up ) – Quad Witching Machines in full retard mode... This is the biggest 2-day swing since Dec 2011. “Most Shorted” stocks are up 4.75% from yesterday’s lows – the biggest squeeze since October 2011. What a farce. After printing 40.8 in November – a 21 year high – Philly Fed collapsed back to 24.5 (missing expectations of 26.0). New Orders, employment (lowest since April), and the workweek plunged as The Philly Fed notes the survey suggests aslower pace of expansion of the region’s manufacturing sector. Despite plunging oil prices, the prices paid index only fell modestly… on the heels of the PMIs, it appears the “US economy is awesome” meme is coming unglued rapidly. The December Manufacturing Business Outlook Survey suggests a slower pace of expansion of the region’s manufacturing sector. Firms were less optimistic about employment increases over the next six months, however, andconcerns about rising health?care costs continue to be reported. “A sharp slowing in service sector activity alongside a similar easing in the manufacturing sector takes the overall rate of economic expansion down to the weakest since October 2013. The extent of the slowdown suggests that economic growth in the fourth quarter could come in below 2% which, with the exception of the downturn caused by adverse weather in the first quarter, would be the worst performance for two years. “The slowdown is linked to weaker growth of new business as customers becoming increasingly worried about the economic outlook both at home and abroad, with the prospect of higher interest rates cooling demand alongside side rising global geopolitical concerns. Across both manufacturing and services, new business grew in December at a pace well below the rates of expansion seen earlier in the year. I will leave you tonight with this piece from Brandon Smith. He believes that the IMF is now ready to replace the dollar with the new SDR’s we have been hearing about for the past several years. As I predicted last month in “We Have Just Witnessed The Last Gasp Of The Global Economy,” severe volatility is now returning to global markets after the pre-game 10 percent drop in equities in October hinted at what was to come. That particular article was only a summary of a dangerous trend I have been concerned about for years; namely the strategy by international financiers to create a dollar-collapse scenario that will be blamed on prepositioned scapegoats. I have no idea what form these scapegoats will take – there are simply too many possible triggers for fiscal calamity. What I do know, though, is the goal of the endgame: to remove the dollar’s world reserve status and to pressure the American people into conforming or even begging for centralized administration of our economy by the IMF. No one can now argue against this reality after we have witnessed hard evidence of Goldman Sachs dictating Federal Reserve policy, as outlined here. And, most recently, we now know that international bankers control political legislation as well, as Congress passed with little resistance a bill that negates the Frank-Dodd restrictions on derivatives and places the U.S. taxpayers and account holders on the hook for more than $303 trillion in toxic debt instruments. The bill is, for all intents and purposes, a “bail-in” measure in disguise. And it was pushed through with the direct influence of JPMorgan Chase CEO Jamie Dimon. The Federal Reserve, the U.S. government and the dollar are as expendable to the elites as any other economic or political appendage. And it can be replaced at will with yet another illusory structure if this furthers their goal of total centralization. This has been done for centuries, and I fail to see why anyone would assume that globalists would change their tactics now to preserve the dollar system. They call it the “New World Order,” but it is really the same old-world monetary order out of chaos that has always been exploited. Enter the IMF’s old/new world vision. In articles over the past year, I have warned that the plan to dethrone the dollar and replace it with the special drawing rights basket currency system would be accelerated after it became clear that the U.S. Congress would refuse to pass the IMF reforms of 2010 proclaiming “inclusiveness” for developing economies, including the BRICS nations. The latest spending bill removed any mention of IMF reforms. The IMF, under Christine Lagarde, has insisted that if the U.S. did not approve its part of the reforms, the IMF would be forced to pursue a “Plan B” scenario. The details on this “plan B” have not been forthcoming, until now. The BRICS are not the only nations demanding the U.S. lose its supposed “influence” over the IMF. Germany, the core economic pillar of the EU, called for America to relinquish its veto power back in 2010 just as the reforms measure was announced. The IMF decision to possibly eliminate U.S. veto power and, thus, influence over IMF decisions may come as early as the first quarter of next year. This is the great “economic reset” that Largarde has been promoting ad nauseam in multiple interviews and speeches over the past six months. All of these measures are culminating in what I believe will be a more official announcement of a dump of the U.S. dollar as world reserve currency. Along with the imminent loss of veto power, I have also written on the concerns of the coming SDR conference in 2015. This conference is held only once every five years. My suspicion has been that the IMF plans to announce the inclusion of the Chinese yuan in the SDR basket and that this will coincide with a steady dollar dump around the globe. Multiple major economies have already dropped the dollar in bilateral trade with China, and engineered tensions between the U.S. and the East have exacerbated the issue. This is it, folks; this is the endgame right in front of our faces. The year of 2014 is the new 2007, with all the negative potential but 100 times more explosive going into 2015. Our nation has wallowed in slowly degrading financial conditions for years, hidden by fake economic statistics and manipulated stock prices. All of it has been a prelude to a much more frenetic and shocking event. I believe that we will see continued market chaos from now on, with a steep declining trend intermixed with brief but inadequate “dead cat” stock bounces. I expect a hailstorm of geopolitical crises over the next year to provide cover for the shift away from the dollar. Ultimately, the death of the dollar will be hailed in the mainstream as a “good and necessary thing.” They will call it “karma.” They will call it “progress.” They will even call it “decentralization” and a success for the free market. But it will not feel like a positive development for the American public, who will suffer greatly as the dollar crumbles. Only those educated in the underpinnings of shadow banking will understand the whole thing is a charade designed to hide the complete centralization of sovereign economic governance into the hands of the globalists, using the IMF and BIS as “fiscal heroes,” saving the world from a state of economic destruction the elites themselves secretly created.